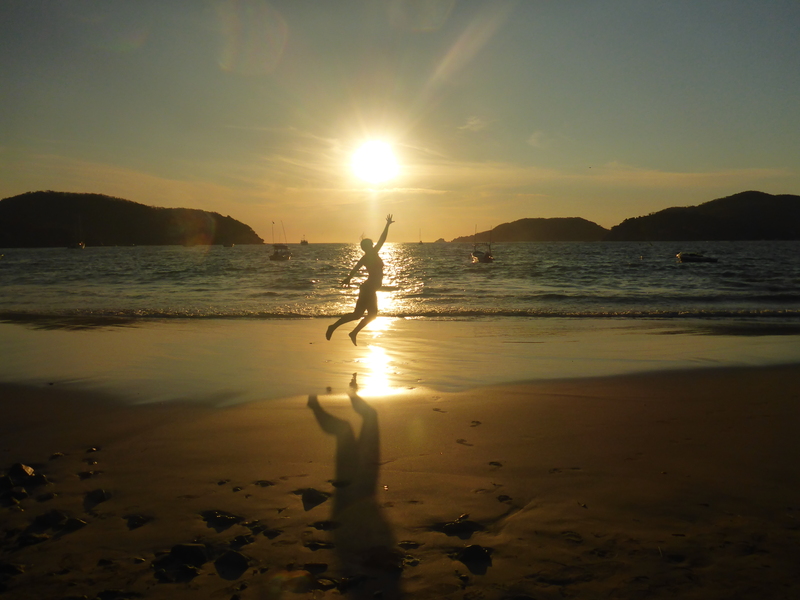 Zihuatanejo and beaches, beaches, beaches! From Manzanillo we caught an overnight bus to Zihuatanejo another beach town further down the coast. We kinda did two no-no’s in this trip; a second class bus and overnight. Travelling through three States in the process, one being Michoacan again, is also not recommended. The bus was surprisingly comfortable for a second class and we decided it was more appropriate for it to be named a first and a half class. We were stopped once during the night and armed personal of some description boarded and checked some ID’s but I was fast asleep, Tom informed me of this after I woke. The bus made good time and we arrived in Zihuatanejo in the dark before 6 am. Our hostel would only be open from 7.30 so we sat around in the station for about an hour trying not to fall asleep. After enquiring about buses or collectivos to the Centro without success we took the easy option of a taxi. Arriving at the hostel we settled in to our room which felt like it was located in a jungle. The property had huge mango trees and gardens between the reception and the rooms. Unfortunately that was one of the only positives of the hostel. Though it wasn’t bad by any means we felt that it overpriced for what it was. To put it another way, I got used to cold showers while here. After a short lie down as neither of us had got a full nights sleep we were off to the beach! The weather had changed a lot since Manzanillo and we had gorgeous sunshine for the whole week. Our first beach was Playa Madera right in front of centro. Quiet in both people and surf it was lovely and we lazed around in the water for ages before walking around to the end of the beach. The tide was perfect and we spent at least an hour exploring the rock-pools. We discovered blue fish, grey fish, big spotty fish, other fish, crabs, anemones, hermit crabs, heaps of sea urchins and all sorts of other sea creatures I don’t have names for. Feeling a little pink we headed back to our hostel. The biggest reason we prefer hostels over hotels even though they are often a similar price is the kitchen facilities. We love to cook (as I think I’ve said many a time) and providing our own meals is a break from the easily accessible grease, meat and carb loaded Mexican foods. Another negative point against the hostel was the amount of fruit flies swarming the kitchen and lack of fridge. A little gross. We discovered the Mercado and it was great, small but perfect, lots of places to eat as well as places to buy veges, fruit, meat and other goods. We cooked most nights, quickly working out that our go-to easy pasta was too warm for the climate here. Next day was another beach visit, this time on the opposite side of the bay to a beach called La Ropa via a collectivo. Once there we quickly determined that walking around the rocks to another small beach called Las Gatas was easy peesy. We felt quite smug making our way to this beach for only a total of $15 peso when the water taxi would have cost us $80. Las Gatas was quite busy compared with the town beach we had swum at the previous day and was full of beach bars trying to get our attention. We ignored them initially until we had explored the beach sufficiently and then ordered two beers which allowed us to use sun loungers. Tom immediately headed into the water with a pair of cheap goggles to look at fish on the small reef in the bay. I paddled and swum for a while before heading back to the loungers. We were out all afternoon and having not eaten since breakfast we had an early dinner at a fonda in the mercado. This meal was absolutely blissful (I was starving) and I discovered a new favourite: fajitas. For some reason I had assumed this dish was not “real Mexican” as I hadn’t seen it previously but it was quite common in Zihuatanejo. Since then we have adopted this as one of our easy meals to make when we have access to kitchens; chicken, capsicum, onion and garlic with guacamole, salsa and tortillas. A bit of an extension on the fajitas dishes we ordered as they don’t have guacamole but instead serve it with rice and frijoles. Both are equally as delicious. Returning to the hostel we discovered the extent of our sunburn, Tom’s back was completely and vibrantly red from swimming around on the surface watching fish all afternoon. Not to be left out I had bright pink legs, whoops must have missed them with the sunscreen. The next few days would be uncomfortable. Even sunburnt we would not be put off going to the beaches around Zihuatanejo. We decided to take it easy and just swum at the town beach again with copious amounts of sunscreen and Tom wearing a t-shirt to protect his sore back. After getting our fill of the water we retired to some seats at a beach restaurant for some beers. After a few of these we were feeling a little peckish so ordered some guacamole. Tom declares this the best we have had because of the salsa which accompanied it. Made fresh that morning by the staff it was rich and ruthlessly spicy so I proceeded with caution but Tom polished the whole bowl off. The next day we were off a little further afield to Isla Ixtapa. Ixtapa is a town very close to Zihuatanejo, about 15 minutes drive. From what we saw this town seems to be where all the large resort style hotels have been built. It appeared very fancy and very touristy compared to Zihuatanejo, I know we picked the right town to stay in. 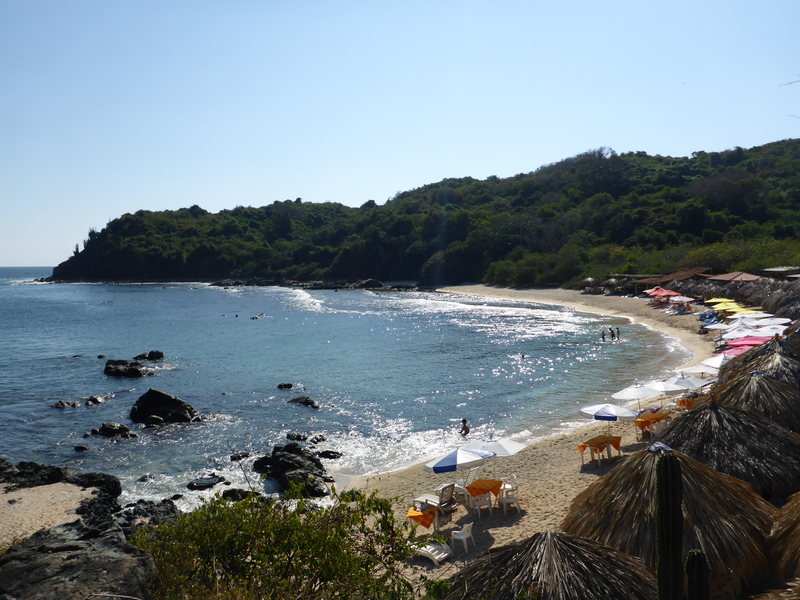 Isla Ixtapa wasn’t as busy as Las Gatas but there was still a lot of people about on the three main beaches. We headed straight to Coral Bay where we had read that there was great snorkelling. We settled on a table and ordered two beers. This is pretty standard for us and our way of cheating the system a little. The restaurants/bars/beach shack places will let you use their tables and loungers but only if you buy something. So we find the cheapest beers and only buy one each. It’s a better alternative to dumping our stuff in the sand, but we will still do that occasionally as well. 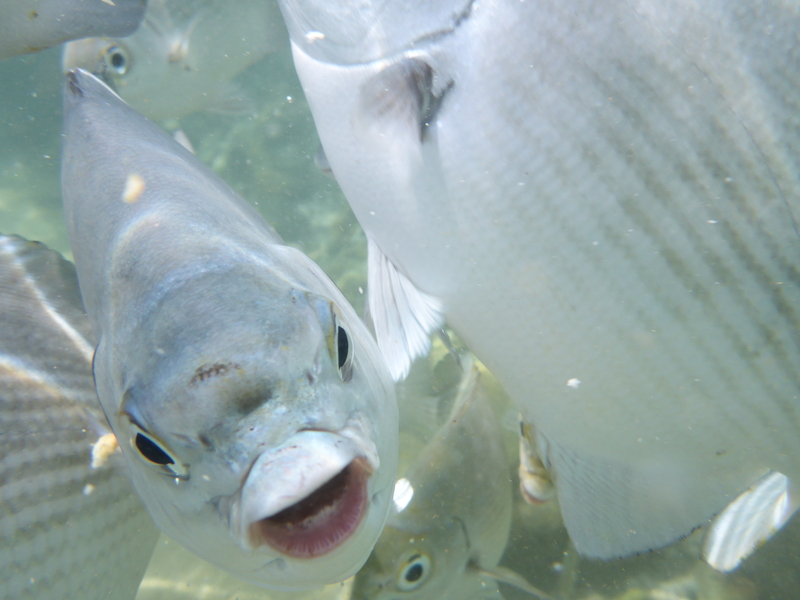 The fish are well trained at this beach and will swarm around the shore when food is provided. In this case pieces of tortilla the restaurant staff throw in the water for the wonder of the tourists. We knew this from our online research and had stocked up with OXXO’s finest (read: cheapest) crackers. Sprinkling them in the water while standing knee to waist deep would result in the fish swimming around your legs. You could hold some cracker under the water as well and they would eat from your hand, kinda scary though as they were decent sized. Even without the food I had an entourage of small black and yellow fish around me at times. It was cool until I realized that they were nipping me. After that I moved around more. Tom headed out further to find bigger fish with his sore sunburnt back protected again by a t-shirt. I swum around and just enjoyed treading water and looking back at the beach and people watching. 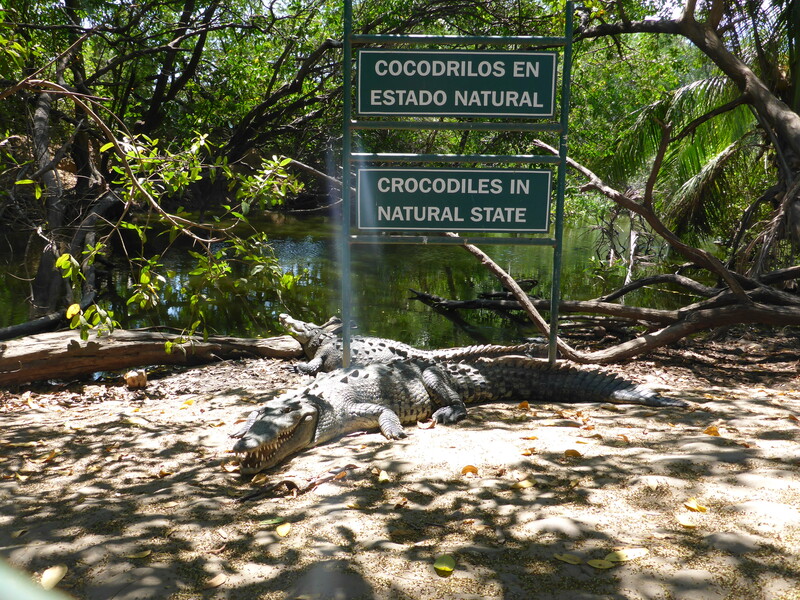 It was a great afternoon out and in the way back to the bus we stopped by the crocodile habitat. There were heaps of them lying stealthily in the water and being Mexico the fences were close and low so great for viewing as long as you don’t do something dumb like climb over the fence. Playing spot the iguana became a bit of a game as well. 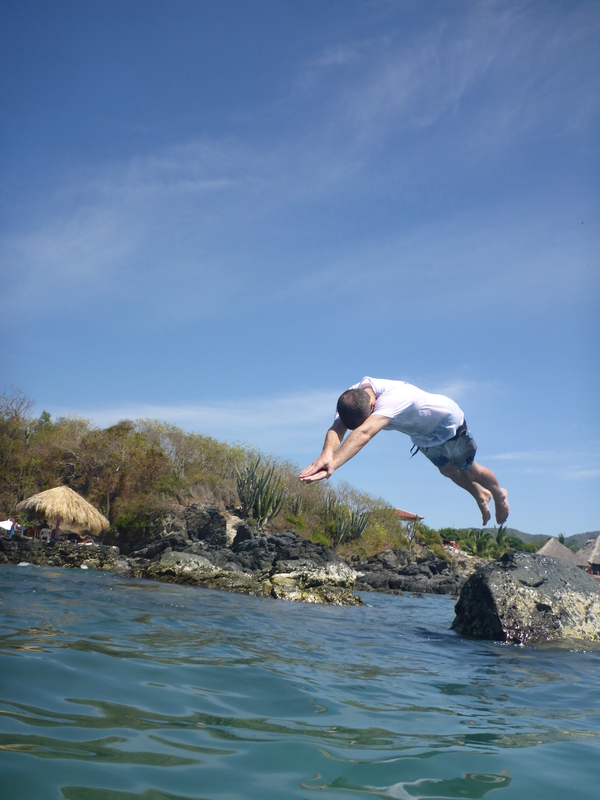 As you can see we got into a rhythm while staying in Zihuatanejo; sleep in, go to the beach, get food, cook and repeat. Deciding to give our poor sunburnt skin a break we coated ourselves in sunscreen, layered up and headed out in yet another collectivo. This time our destination was Playa Larga, or long beach in English. How many places have beaches named this I wonder? It lives up to the name stretching out to the south for far too many kilometres for us to walk. So we walked to the north end of the beach which was much more achievable but still at least 40 minutes. This beach is not recommended for swimming and we soon saw why; the waves were huge! Clambering over the rocks at the end of the beach we watched the waves smash into rocks and the resulting foamy water for quite some time. Well until a big wave hit the rocks near me splashing me with salty water. Tom found this very entertaining, luckily I was using our tough camera that day so no damage done. We sat at a beach front restaurant to watch the waves for a while more before getting the bus back to Centro. 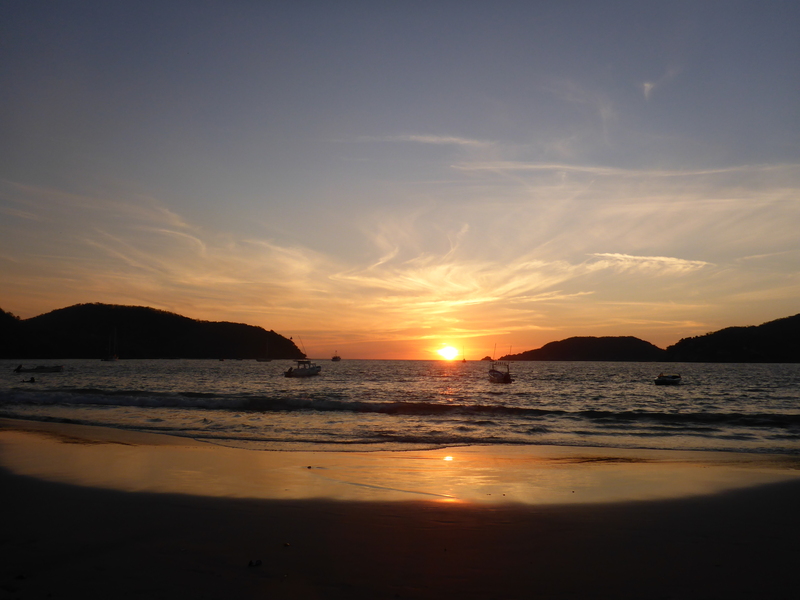 That afternoon we returned to Playa Ropa for another walk and to watch the sun set. I think it is the only time I have purposely sat to watch and it didn’t disappoint. 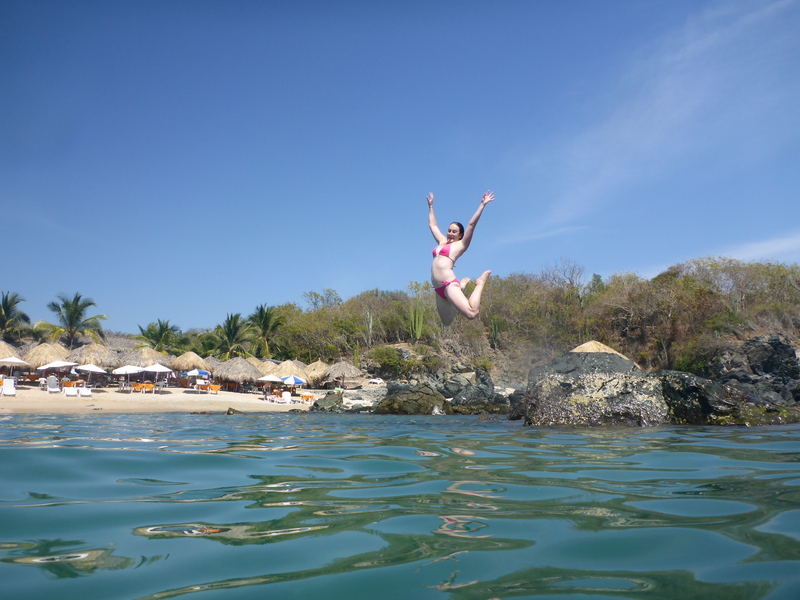 On our last day we returned for the third time to Playa Madera to enjoy the peacefulness and ease of that beach. After swimming for a while we went decided to sit at one of the small restaurants and have a few drinks. They had 2×1 margaritas advertised so we mixed it up a little and splurged on a few of those as well as beers. The cocktails which we have had while being in Mexico (we don’t buy them often because we are cheap) have been generous on the alcohol, no perfectly measured shots here I don’t think. So when drinking a margarita, daiquiri, piña colada etc. you can taste the alcohol instead of just having a candy sweet drink like we would get back home. Being sensible we also had some guacamole, YUM! 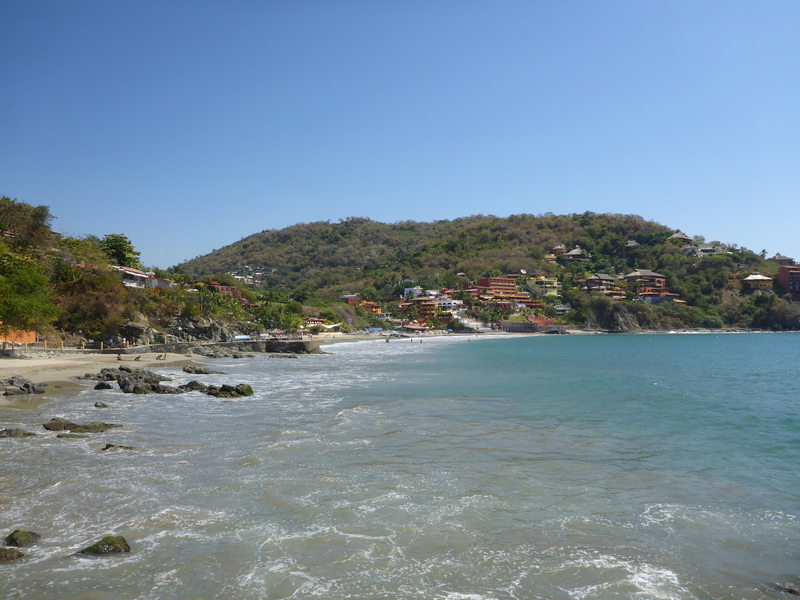 And so ended our last day in Zihuatanejo, we would miss this quiet, under-rated beach town. What we achieved from the week spent here was sunburn, relaxation, a new meal, and a decent tan (after our skin stopped being pink). It wasn’t time to leave the beach just yet, our next stop was Acapulco with a very eventful four days ahead. This entry was posted in Backpacking, Countries, Mexico, Travel and tagged Backpacking, Beach, Coral, Fish, Isla Ixtapa, Ixtapa, Playa, Reef, Zihuatanejo by twostraykiwi. Bookmark the permalink.